Kommunist was mainly addressed to the Bolshevik Party but here Bukharin turns on the enemies of soviet power with a following in the working class and the peasantry, the Mensheviks and Socialist Revolutionaries (SRs). Having dominated the soviets until the autumn of 1917 both parties made it clear that they thought it was time for them to be abandoned and replaced by parliamentary democracy. This and their refusal to end the war, but attempt to prosecute it to victory, cost them a great deal of support. The SRs split over the fact that even when their leader Chernov was Minister of Agriculture the bulk of the party refused to support peasant land seizures. The Left SRs became supporters of the October Revolution and were part of the soviet government when this article was written. Thousands of Mensheviks went over individually to the Bolsheviks when it was clear the leadership did not intend to support soviet power. Menshevik support collapsed but still they clung to the idea that what Russia needed was parliamentary democracy headed by the capitalist class. At first they thought Bolshevism and soviet power (which by their abandoning of the soviets they made the same thing) would not last a week but once it was clear that not only could it survive against all the odds they were then faced with harder choices. Initially they tried to set up “democratic” governments in support of the Constituent Assembly but few rallied round. At this point they split in various directions with some SRs openly siding with monarchist White generals under the flag of Russian nationalism. Bukharin’s “review” is of some of the shifts and manoeuvres of this opposition as they sought to overturn soviet rule in the period between October 1917 and March 1918. There is no one more detestable than a parasite with the physique of a slave disguised as a revolutionary. And no creature is more repugnant than a powdered prostitute wearing a schoolgirl’s dress to "make herself look innocent". Yet history shows that even political parties can take on this character. They swear on their purity, their sanctity, and their dedication to the "popular cause"! But their "dedication" like their "betrayal" looks like two drops of water and their apparent purity is a layer of white under which hides a far from pure and holy "picture". During the Russian Revolution, it was the Mensheviks and the Socialists Revolutionaries (SR) who showed themselves to be just like this. 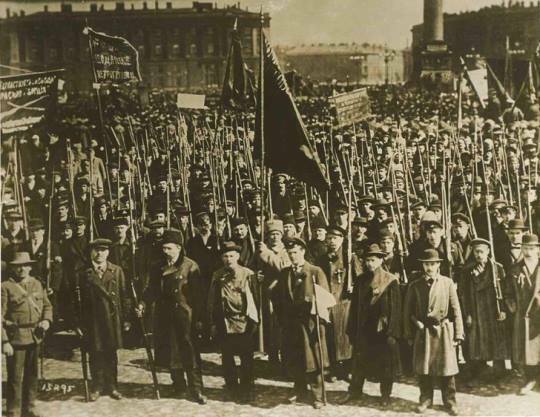 Just as Western European imperialism stifled the labour movement in the hands of official social democracy, in Russia the most infamous, the most ferocious, massacres against the working class, and the peasantry, were perpetrated by these so-called "socialist" parties. Kerensky's June offensive, the crushing of the proletariat in July1 and the campaign of slander against it by tsarist prosecutors and the stupid and brutal police, the disarming of the proletariat, the carrying out of the death penalty at the front2, the executions, the ferocious massacres of peasants who had no respect for land ownership, the attacks of officer cadets and White guards against the workers and the soldiers in October, the organisation of the revolt of the bourgeois, the nobles and the officer cadets by the SR Gotz3, the organisation of sabotage, permanent conspiracies against Soviet power, the support given to the Ukrainian Rada by the SRs and Mensheviks (together with that granted to landowners and citizens) – this is the catalogue of key facts which illustrate the attitude of these parties during our great revolution. The latest events in Russia and the extremely difficult situation on the international front gave new strength to those parties that were about to fade away. The difficulties of this situation, have revived the hopes of those whose primary goal was to overthrow the power of the workers and peasants . . . since Russia "is not yet ripe" for the disappearance of capitalist oppression. In Nikolayev, in Odessa, throughout the south of the country that has suffered the invasion of German troops and some haidamaks [Cossacks – editor] unleashed by the Rada, Menshevik citizens "took advantage of this moment" to make any response impossible and overthrow the Soviet power. At the moment when the situation required organised evacuation, these kind gentlemen put forward the slogan: "Not a pud4 of steel, nor a pound of oil for export! " (all of this, you see, causes unemployment). The closer the Germans got, the more arrogantly they demanded the Constituent Assembly. The Mensheviks and Right SRs are a mirror of the bourgeois soul. Currently the bourgeoisie, which is not willing to defend the socialist homeland, is committed on two fronts: some are pro-German, others are pro-Japanese and English. These gentlemen the bourgeoisie, are already prepared to turn Russia into a colony to get rid of the Bolsheviks. And, as always happens in the colonies, the different fractions of the bourgeoisie are in search of a protector wherever they come from. If foreign capital is behind some Mechtcherski, another capital stranger stands behind the "Stakheievskaya" group.5 And when he frees himself from the "yoke of the Bolshevik brigands", our virtuous bourgeois sings his refrain according to these "relations". And why are the Mensheviks and the SRs late in their attacks against the Bolsheviks in support of the capitalists? With "the Russian soul", where patriotic feelings are particularly strong, SRs, constitutional democrats, popular socialists and followers of Plekhanov6 find a way to "debate" support for the Japanese admiral who boldly carried out a landing in Vladivostok. It is true that the SR Central Committee "denied" their participation in this treacherous meeting. Yet their "unofficial" newspaper, Zemlya i volya7, treated this act of looting by Admiral Kato8 very kindly. "If our allies (the same! ), in the West, resist the enraged offensive of the German troops; if in Russia the people get up and start to struggle for independence, landing Allied troops will be useful to us". (Number 246). And in Number 248 of the same newspaper, SRs "perceive" that "it is not a war against Russia that the Japanese government is currently considering ". It is not surprising that with such a "state of mind" the comrades of Dan, Martov and Savinkov9, look, for support in the Far East, to the detachments of Captain Semyonov's10 Cossacks, Japanese White guards (see the interesting articles of Comrade Neyboute in Izvestia TsIK11), from "ancient China and powerful Japan", which just jailed the best Japanese socialist leaders. This "point of agreement" covers four questions: 1) not to accept the peace and to unite completely with the Allies; 2) convene the Constituent Assembly; 3) restore the zemstvos and municipalities; 4) form a cabinet of coalition ministers without Bolsheviks or Left SRs. The "Programme" is dictated by the Constitutional Democratic Party, that is, say by financial capital. It's interesting to see that not only the followers of Plekhanov, but also the "united" Mensheviks, led by Martov, obediently follow all the directives of this capital. The newspaper of Martov and Dan, Vperyod15 Number 54, published its “manifesto” with “grievances” about the re-elections. This "document" differs from the first only in going further by adding to the political demands of the capitalists its economic ones. It maintains that “workers’ control has disorganised production (this opinion is shared not only by Promichlennost I Torgovlia16 but also by the Allied consuls in the Far East) and that “the takeover of the banks has destroyed credit” and that “anarchy rules instead of a democratic republic” etc. From which one would conclude, perfectly to the taste of Riabuchinski17 and Miliukov18, that it is necessary to reject soviet power, restore the dumas, "end so-called (!) workers' control and the nationalisation of banks"; and, finally, restore the Constituent Assembly and organise "power for all democrats". The best expression of this "request" was provided by the citizen Chvarts19, well known to the newspaper Novy Luch,20 which openly puts forward the slogan "Back to capitalism!” by proposing to restore all workshops, banks and factories to the capitalists. This "platform" that Mensheviks citizens have dared to propose to the Russian proletariat, is amply complemented in their "practice". We refer here to the Caucasian abuses of the “Thiers” Mensheviks. The applause for peasants and landowners, the shootings of protesting workers, the ban on the workers' press and, on the other hand, the full freedom of the bourgeois press, the arrests of the leaders of the labour movement everywhere in Transcaucasia – this is the "flame" ignited by the Menshevik Government of Jordania-Gegechkori.21 The Menshevik agitators led by Martov may try to stay silent about it, to falsify reality, to hide their crimes, but nothing helps. The Muscovite proletariat does not appreciate the attitude of this "social-democratic party" (which is united to the bourgeoisie). “In Moscow”, wrote citizen Martov in Number 52 of his newspaper, “the rise of opposition opinions. . . will be clearly demonstrated by the result of the new soviet elections”. The result of this "demonstration" exceeded the hopes of the most convinced Communists. The Mensheviks and Right SRs have completely missed their target and the "social-democratic party" (in coalition with the bourgeoisie) got fewer mandates to the soviets than it had before. Communists (the party of the socialist revolution) will have the same success as before if they maintain the same line without compromise. This party won the elections in Moscow because it had put forward the revolutionary point of view against the chatter of agents of the bourgeoisie. Any retreat on this level would mean degeneration in our own ranks. This is one of the lessons of the new "electoral campaign". 2. The question of the death penalty was amongst the most sensitive in the course of the year 1917. Abolished after the revolution of February, the high command is constantly demanding its restoration to maintain discipline within the army, which Kerensky granted in July. The Soviet government would follow the same path: it was abolished at the Second All-Russian Congress of Soviets (November 1917), even at the front, but was re-established in June 1918. 3. Abraham Rafailovich Gotz (1882-1940) millionaire’s son, centre right leader of the Socialist Revolutionaries in 1917, the day after the October Revolution he became a member of the "Committee for the Salvation of the Fatherland" and one of the architects of the failed uprising of the officer cadets in Petrograd on 29 October, aimed at overthrowing the Bolshevik government. 4. Unit of weight used in Russia until 1924 equal to 16.38 kg. 5. The Stakheyev group included the Russo-Asian Bank, the family businesses of Elabugs and Stakheyev, the commercial house "I. G. Stakheyev", etc. As for Mechtcherski, this group proposed to form a trust to manage iron and steel in the Urals in conjunction with the state, the Stakheyev group and American capitalists. Hence Bukharin’s allusion. Nothing came of this proposal. 6. George Valentinovich Plekhanov (1856-1918) one of the first theoreticians of revolutionary Marxism in Russia. A long time Menshevik he went over to social chauvinism in the First World War. 7. Land and Liberty, journal of the Right Socialist Revolutionaries published in Moscow. Its publication ceased during the spring of 1918. 8. Admiral Kato Kanji (1873-1939): Japanese officer, renowned for his intransigence, who led the naval squadron in front of Vladivostok on 12 January 1918. He claimed he was under orders from his superior, the Minister of the Navy, Admiral Kato Tomosaburo, for a massive landing to eliminate the Bolsheviks and firmly establish Japanese leadership in the Far East. The landing was not completely followed up, for fear of international complications, but under the guise of protecting Japanese nationals, Kato Kanji disembarked his troops on 5 April 1918. 9. Bukharin lumps together three Russian socialists with markedly different careers. Feodor Ilich Dan (1871-1947): Right Menshevik and freemason, supported the Provisional Government in 1917. He broke up with defencists in October and joined with his brother-in-law Martov and the Menshevik-Internationalists. Julius Martov, whose real name was Yuli Ossipovich Tsederbaum (1873-1923): main spokesperson for the Menshevik-Internationalists, he opposed Bolshevik politics while at the same time providing support in the fight against counter-revolutionary forces. He finally chose exile in 1920. Boris Viktorovich Savinkov (1879-1925) Revolutionary Socialist and Russian writer, he was one of the leaders of the SR Combat Organisation before the war, and later advisor to Kerensky before taking up arms against Soviet power soon after October. 10. Grigori Mikhailovich Semyonov (1890-1946): Russian ataman and officer in the imperial army. After the October Revolution he took refuge in Manchuria before becoming one of the most brutal leaders of the trans-Baltic counterrevolutionary forces. He especially helped the Czechoslovak legionaries in their journey in August 1918. During the war he accepted the help of Great Britain, France and, of course, Japan. Capture by the Red Army in September 1946 in Manchuria, he was sentenced to death and executed by hanging. 11. TsIK (also known as VtsIK or Tsay-ee-kah) All-Russian Soviet Executive elected by the Congress of Soviets. 12. Dimitri Leonidovich Khorvat (1858-1937): General of the Russian Empire, but also director of the Chinese Eastern Railway Company since 1903, before his attempted dismissal in November 1917 by the Harbin Soviet. The company then became the backbone of counter-revolutionary forces in the region. With White guards and Chinese troops, Khorvat took over Harbin and control of the railway lines. At the insistence of the British War Office, Admiral Kolchak joined the executive office of the company and after an interview in Beijing with Khorvat and Putilov, he was officially appointed commander-in-chief of the Far East Russian forces. 14. Expression used by Bolsheviks to designate intellectuals who had gone over to the workers. 15. Forward was the main journal of the Central Committee of the Mensheviks in Moscow, and of Martov, in particular. 16. Production and Trade monthly of the trade industry published in Petrograd. 17. Pavel Pavlovich Riabushinsky (1871-1924): important Moscow industrialist appointed Chairman of the Moscow Stock Exchange Committee in 1915, he also edited a liberal opposition newspaper after 1907. 18. Pavel Nikolayevich Milyukov (1859-1943): historian and Russian politician, Minister of Foreign Affairs of the Provisional Government after February 1917 and main leader of the Constitutional Democrat (Cadet) Party from its foundation in 1905. 19. Most likely S. M. Schwarz (1879-1951)): one of the leaders of the right wing of the Menshevik Party. Kowalski reports that according to George Denicke (1887-1964), historian of Menshevism, it would be to A. N. Potresov that one should attribute the formula quoted, while Schwarz thought, considering Russia's state of backwardness, that the most appropriate formula was rather "forward towards capitalism"! 20. The New Ray, Menshevik daily, the successor to Iskra and Rabochaia Gazeta. Organ of the Bureau of the Central Committee and the Petrograd Committee, it was able to continue his publication until June 1918. 21. Noah Jordania or Zhordania (1868-1953): Georgian journalist and politician, leader of the Georgian Mensheviks, President of the Tbilisi Soviet in 1917, he was President of the Government of the First Democratic Republic of Georgia from 1918-21. Evgeni Gegechkori (1881-1954): Georgian lawyer and politician, leader of the soviet deputies of soldiers of Transcaucasia, he was the Minister of Foreign Affairs of Menshevik government of Georgia.